A golden moment. 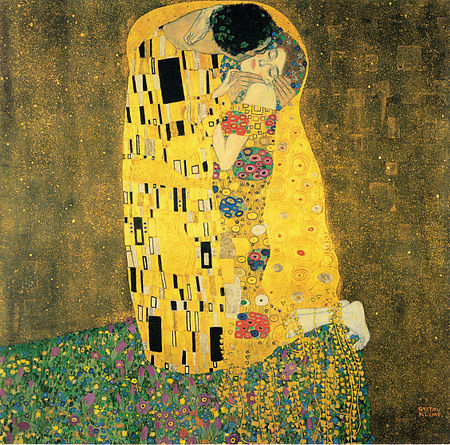 Gustave Klimt’s the Kiss (Der Kuss). Their love, multilayered and complex. Intricate symbols lavish the lovers’ robes. Haloed in gold leaf, they kneel among the flowers afield outside space and time. The man, a kiss to her cheek (not mouth) the woman, in repose, her eyes closed. In a dream? In bliss or just tired? The tenderness is palpable, yes. The sacrament of tenderness. It’s much lauded in the relationship between mother and child. But what about lover to lover? Tenderness– more than affection and less than passion. Kindness intensified by desire. Desire mellowed selflessness. Opening the soft underbelly of us in a gentle offering of acceptance. Tenderness trumps sacrifice as the ultimate gift of love, in my book. Because sacrifice demands a repayment (often implicit) that most of us are often unable to afford. And it’s terrible to be penniless in love. The difficulty receiving such tenderness is also hinted at in the painting. Is she worthy, is she unworthy. Does it matter? Will she kiss him back? Can she accept his supplication without shame, loathing or regret? The love deacon passes the offering plate today, my friends. Maybe you will keep your gold, maybe you will give it.